If you’ve been following me on Instagram over the last month, you may have tuned in for my weekly sponsored #TireTipTuesday segment. 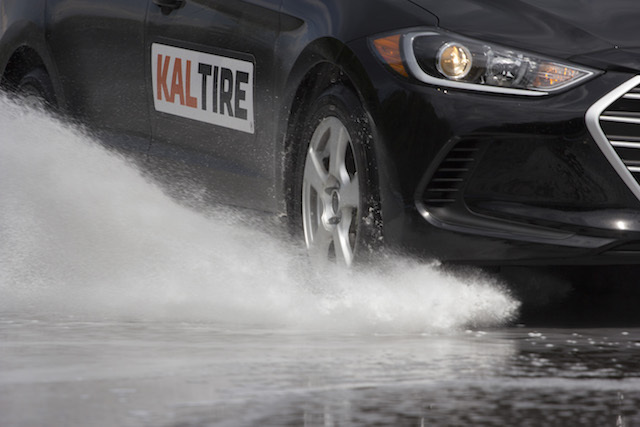 I’ve partnered with Kal Tire to spread the word about safe winter driving, and that all starts with safe tire choices. A Kal Tire winter driving survey confirms many Canadians aren’t making safe tire choices for winter driving: Two-thirds of motorists don’t know how to tell if a tire is winter-rated, and most have misperceptions about when it’s safe to use all-season tires. Results showed that 66 per cent of Canadian motorists don’t know the difference between all-season and all-weather tires. All-season tires are designed for warm, dry and mild wet conditions in temperatures above +7C. Winter tires are needed for traction in cold temperatures, once it starts to dip below +7C, as well as snow, ice and slush. All-weather tires are winter designated, bearing the mountain snowflake symbol, but can also be driven year-round without wearing prematurely in the summer — eliminating the need for tire changeovers or storage. Weather data across Canada shows the average temperature in all major cities drops below +7C in November. In Vancouver, the average temperature is below +7C by November, and doesn’t reach above +7C again until March. I will draw one winner at random from all entries at 12:00pm on Wednesday, December 5, 2018. This prize entitles the winner to receive a set of four (4) winter tires up to $1,200 from ANY Kal Tire location. Offer is to be used by May 1, 2019. For more information, follow Kal Tire on Twitter, Instagram, and Facebook. Update The winner is Taleena Clark! Check for mountain snowflake logo and tire pressure. When your tires don’t have enough tread depth, you’re at greater risk of hydroplaning, punctures and reduced traction. air pressure should be checked monthly! The mountain snowflake symbol is a way to tell if a tire is safe for winter conditions. Look for the mountain snowflake logo to tell if tires are safe for winter driving. Even if you’re running All Weather tires, they should be rotated to get the longest possible tread (I just did mine!!!) but I want to drive to snowshoe a lot more and snow tires would be amazing! If you have an air compressor, get a valve attachment so you can pump up the volume at home. You need winter tires once the temperature drops below +7 degrees celcius. All weather tires have a snowflake symbol, and rotate your tires! Also followed both on Instagram. When getting your winter tires swapped, get your brakes checked at the same time. Check for a snowflake logo on all weather tires (I did not know this!). I bought Kal Tire’s Nokian all weather tires but if I want to leave the Lower Mainland and travel in winter temperatures below seven degrees, I will need some winter tires. Look for the mountain snowflake logo which is a way to tell if a tire is safe for all winter driving conditions. When getting your tires swapped or rotated, get them to check your brakes, too. How’s that for 2 birds with one stone kind of visit. Followed both account on Instagram. Look for the snowflake to be sure your tires are winter driving safe! All weather tires have a snowflake. Rotate your tires and check pressure monthly! Rotate your tires regularly to extend the life of them and improve performance. Need tread. Snowflake on tires. Use winter tires or all weather tires (check for a snowflake symbol) once the temperature drops below 7°C. When you get your tires changed, make sure you check your brakes at the same time!! I just learned this the hard way. 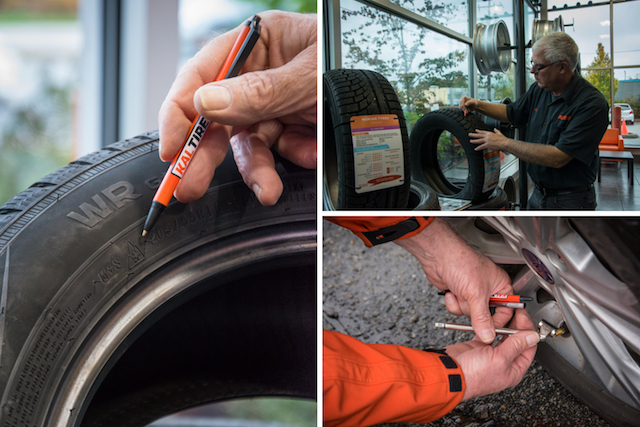 Mark your tires when you take them off/exchange them for summer/winter. Tire Pressure should be checked monthly! Look for the mountain snowflake symbol & have the tires rotated. Check for mountain snowflake ❄️ logo and tire pressure. All-weather tires are winter designated, bearing the mountain snowflake symbol, but can also be driven year-round without wearing prematurely in the summer — eliminating the need for tire changeovers or storage. Check for mountain and snowflake logo! The mountain snowflake symbol is the way to tell if a tire is safe for all winter driving conditions. When changing to winter tires or rotating tires, get your brakes checked too! Tire air pressure should be checked monthly! Following Kal Tire and Miss 604 on FB and Instagram. Followed Kal Tire and Miss 604 on FB. When getting winter tires swapped, or all weather tires rotated, get brakes checked at the same time. Kal Tire has the best service! Look for the snowflake symbol to know you are good for winter driving, check air pressure monthly. Make sure you know how much tread is left on your tires as with less tread, you have less traction which endangers you and others on the road. All season tires shouldn’t be used for temperatures under the 7c mark. All season tires shouldn’t be used if the weather dips below 7c. Following Ok Tire and Miss604 on Facebook! Check your air pressure monthly,the mountain snowflake symbol is a way to tell if it is safe to drive in all winter conditions! Tip: Check your tire pressure monthly. It’s a good idea to check your brakes at the same time you change over to your snow tires. Thanks for the tip! Tip : check tire pressure monthly. Super Liked and followed OK Tire and Miss604 on facebook. Love all your contests and thanks a million for them Miss604! Check air pressure monthly and look for the snowflake mountain symbol to know you are good for winter driving. Check your brakes when you change to snow tires! Tip: check air pressure ! I just found this out myself last week, inside the drivers or front passenger door you will find a sticker with the tire size and air pressure for your vehicle. Check air pressure and look for snowflake symbol! When you are swapping out your winter tires you should also get your brakes checked. Tire’s air pressure should be checked monthly. Check for the snowflake symbol and check your tire pressure! Check your tire pressure and look for the snowflake symbol to indicate winter tires. Rotate tires and have a full set of summer and winter tires 😊. Tire Tip: Air pressure should be checked monthly because a seasonal temperature change can cause tire pressure to drop. Air pressure should be checked monthly but a seasonal temperature change can cause tire pressure to drop. Kaltire offers free air pressure checks! Check for the snowflake symbol on your tire to know if they we made for driving in the winter time! Also following on FB and Twitter for both KalTire and miss604! The tire pressure to be checked every month. And the snowflake symbol indicates it’s safe for winter. Check your tire pressure monthly. Tire tip! Check brakes at same time that you put your winter tires on! Tread depth is important for traction. Not enough tread depth and your tires become ineffective. You should check the tire pressure once a month. And the snowflake symbol indicates it’s safe for winter. Check your tire pressure and tread depth. Rotate and balance tires. In Canada, only 32% of the drivers know that the mountain snowflake emblem on a tire means it’s safe for all winter driving conditions. When you swap out your summer tires for winter tires, get your brakes checked as well. Check your air pressure at least once a month. Rotate tires and also check brakes at the same time! Check tire pressure once a month. Check brakes when switching to winter tires. Following both on Facebook & Instagram! Tip: When your tires don’t have enough tread depth, you’re at greater risk of hydroplaning, punctures and reduced traction. Check for the mountain snowflake logo for tires used in the winter (temp below 7C). A snowflake symbol indicates that the tire is safe for winter use. entered everything liked and followed! Check tire pressure & tread depth regularly. Make sure to check the is a mountain snowflake for winter tires and to check Tire pressure as it did in cold weather. Check tire pressure at least monthly. Tire pressure can change with temperature drop or increase. Look for the snowflake symbol when choosing winter tires. That tells you it is certified for winter conditions. Check your tires regularly to ensure they have the correct air pressure and tread depth. This will reduce the chances of hydroplaning, punctures, and reduced traction. The snowflake symbol indicates that the tire is all weather and good for all seasons. Pressure should be checked monthly, cool temps can drop pressure. Check your tire air pressure monthly! Below 7 degrees Celsius, the rubber in all season tires becomes too hard to maintain a safe grip on the road surface. You need to switch to winter tires or all weather tires. Below 7 degrees C, the rubber in all season tires becomes too yhard to maintain a safe grip on the road surface. Switch to winter tires or all weather tires. Look for the snowflake symbol on your tires and check the pressure monthly! Check your tire pressure monthly (written inside your car’s front driver’s door) and check for the mountain snowflake symbol for winter tires. Even if you have all weather tires they should be rotated for even wear. Rotate your tires about every 8,000 kilometres. Filling both pages on Facebook. Air pressure should be checked monthly. Seasonal temperature change can cause tire pressure to drop. Following Kal Tire and Miss604 on FB and IG. A good idea to rotate even All Weather tires, and,- to check brakes at same time. Check your tires for the mountain/snow flake symbol to ensure they are rated for winter driving. Love Kal Tire – great service. What a great way to make the winter safer for the grandkids! Look for the mountain snowflake logo. Check your tire pressure and regularly rotate your tires for even tread wear. Tip: check for the mountain snowflake logo on tires! The mountain snowflake symbol is a way to tell if a tire is safe for all driving conditions. Check to see if you have the snowflake on your tires to get ready for winter. Check for the snowflake logo! Check for the snowflake if you want tires that are safe for all winter conditions. Kal Tire is my favorite tire shop. They provide excellent service. Check for the snowflake symbol to see if tires are suitable for winter conditions. You can’t travel on some roads during the winter without it. Look for the mountain snowflake logo to make sure your tires are ideal for winter driving. If your tires don’t have enough tread depth, you’re at greater risk of hydroplaning, punctures and reduced traction. Check Air pressure monthly and look for the mountain snowflake logo to make sure your tires are ideal for winter driving. Gotta look for the mountain with snowflake logo! Air pressure should be checked monthly, seasonal temperature changes can cause tire pressure to drop. Check the Snowflake icon or M+S symbol before driving in the winter here! Great prize. I leaned that I really need to get All Weather tires so I don’t have to change tires all the time. Winter tires below 7 degrees! Check your Tire pressure once a month and before a long road trip. Thanks for the contest, would SO love some winter tires so that I can get to more places to do my photography! Look for the snowflake symbol! Get the brakes checked when you change tires! Check tire pressure and rotate your tires! Look for the mountain snowflake symbol!! I need winters tires!! winning this would be amazing! My tire tip? Seriously… I tell this to anyone who will listen… Get your tires at Kal Tire and take advantage of their FREE “Customer Care Plan” included in purchase! Free flat tire repair, Free rotations, Free road hazard protection, Free lifetime balancing and Free air, for as long as you own your tires and car! I wouldn’t buy my tires anywhere else! Check for the mountain snowflake symbol! Look for the mountain snowflake symbol to see if you have tires for winter conditions. Rotate your tires yearly, even if you don’t change to winters. Look for the mountain snowflake symbol! Regularly check tire pressure.Look for the mountain snowflake symbol. Rotate your tires. I would love to win, I commute almost 3 hours daily for work and don’t have winter tires! Check your tire pressure monthly. Thank you! Something I need to do: Look for the mountain snowflake symbol..
look for the snowflake symbol to know they are winter tires. Would love to win; I do not have any winter tires and I need them. Look for the snowflake to know if it is a winter tire. Look for the mountain snowflake symbol. Follow KalTire and you on Facebook under Lushka Smith. Switch from all season to winter tires when the temperature dips below +7 for better traction. We always check the tire pressure, rotate the tires too! Check your tire pressure, rotate the tires, and get winter tires for the snow. We just got a car again, since a hiatus of 6 years. We keep on remembering all these little things to do to help with maintenance. Great tips about tire tread for reducing hydroplaning and rotating winter winters and our all seasons… just another thing we should implement to help us out. Check tire presure monthly and after seasonal temperature changes. The mountain snowflake symbol tells you if your tire is safe for all driving conditions! Check your tire pressure every month! It can change with the weather. If you do not have any knowledge of wintee tires, just browse and compare different tires at Kal Tire website, they have information on different tires tested and you will have ideas on what performs best on ice, snow or slush. We are happy with Nokian tires, you will feel the difference on handling and grip while driving. We will always go back to Kal Tire for Nokian tires. Your tire pressure should be checked monthly. Check for weather cracking on older tires and signs of irregular wear patterns on all tires as it can be related to other suspension issues and should be looked into. Rotate your tires and check tire pressure regularly. Oh I sure need these and would love to win! My favourite was the temperature & pressure check. Even you’re all weather tires should be rotated! Snowflake symbol and tire pressure. Look for the snowflake logo! Timing couldn’t be better🤞Rotate all tires for even wear!!! Great Tip. Get your brakes checked at the same time as your tires are changed !! Only 32% of Canadians know the snowflake symbol is the way to tell if the tire is safe for winter! I follow you both on fb (Nicole Graham). Drive safe this winter, everyone! Look for the snowflake symbol to make sure you are driving winter tires. Rotate your tires to give even wear. Check for the mountain snowflake logo on the tires! Even if you’re running All Weather tires, they should be rotated to get the longest possible tread. Check your tire pressure monthly and get your tires rotated to get even wear. Could you please share details of your sponsorship with Kal Tire? According to Ad Standards Canada, you should disclose at the beginning of your post that this is sponsored content, and you only do so at the end of your post and not even included in the body of the post, unfortunately. You’ve written several posts about Kal Tire and I’m sure your readers would appreciate you being upfront about the fact that you’re being compensated to write about their products and services. As you mentioned, you’ll find my disclosure statement at the bottom of this post. You’ll also find that I mention my sponsorship/partnership in the first paragraph. If you look at the Instagram highlight I reference, the story panels contain the hashtag #sponsored. Additionally, every single tweet I have sent also includes the the hashtag #sponsored. According to Ad Standards Canada guidelines, I am in full compliance. It’s a good thing to hold influencers accountable though, thank you for your concern. Check tire pressure monthly and rotate tires according to schedule in owner’s manual. Look for the mountain snowflake logo which is a way to tell if a tire is safe for all winter driving conditions. Also check tire pressure monthly. It’s important to have your tires rotated and balance about every 10,000 km. I follow both on Instagram as cottagebunny. I follow both blogs on facebook.. Check your tire pressure monthly at the minimum! Following Kal Tire and Miss 604 on Facebook! Tip – When you get your tires swapped out have your brakes checked at the same time. Look for the snowflake logo to see if it’s all-weather (vs. all-season, which isn’t safe for even mild winter conditions)! Check tire pressure monthly and rotate your tires. When you are getting your winter tires swapped it all weather rotated, have your brakes checked as well:) following both on fb and Instagram, many thanks for doing this giveaway! Check tire pressure monthly, and you can also store your tires at Kal Tire for a nominal fee while you have your winter tires on. Check your tire pressures monthly – check often during seasonal weather temperature changes as well. A snowflake logo on all weather tires means they’re good for snow. Look for the mountain snowflake logo and check tire pressure. Tip: look for the mountain snowflake symbol to be able to tell if the tires are safe for winter driving. Look for the mountain snowflake. I live at the top of cap hill in Burnaby and phew, without that snowflake we would NOT get up our hill! Check for mountain snowflake symbol to see if tires are all-weather and can be driven in winter and year-round. Tip: If you are from or going to the UK then make sure you spell it as T-Y-R-E-S and not T-I-R-E-S. It’s pronounced the same except for that accent part. Look for the mountain snowflake symbol on the tires! Following both on IG (@hadrad15) and always check for the mountain snowflake symbol to tell if tires are safe for winter conditions. The snowflake symbol indicates tires are meant for winter conditions. Let is Snow. Monthly tire air pressure check. Look for perpendicular wear bars across the tire – if you can see one it’s done! Followed KalTire & Miss604 on IG! Check for the snowflake symbol! The air pressure should be checked monthly. get your brakes checked at the same time you get your tires swapped. Get your brakes checked the same time you get your winter tires put on! When you add new snow tires, do not forget to go back to the shop after 50-100 km to get them to re-torque the wheels. Check tires to ensure it is still safe to use. Make sure you’ve got tired with the mountain snowflake symbol on the sidewall. FYI, I also like to keep a small compressor/battery booster in the vehicle on long haul trips. I’ll be moving to Kamloops for school for 8 months next July, and winter tires would be a fantastic prize for me! Get your brakes check at the same time you get your tires swapped. Beep! Beep! Tire tip: buy all-weather tires. For the vast majority of us here, living & driving exclusively in the bubble of Metro Vancouver, all-weather tires are sufficient for the limited snow we see and, as mentioned, save you more than doubling your tire costs. Yes, they’re not quite as good as straight winter tires but they’re night-and-day compared to sticking with all-seasons all year round. All seasons don’t work as well when temp drops under 7 degrees. Change to winter tires to be safe! Check the mountain snowflake logo for tires safety for winter driving. The snowflake symbol is the way to tell if a tire is safe for all winter driving conditions, and check your tire pressure! When you are swapping your winter tires get your brakes checked at the same time. Following on instagram and FB. Check tire pressure monthly. Look for the snowflake symbol on winter tires. Check your tire pressure regularly to save on gas consumption! Check your tire’s air pressure monthly. If your vehicle has sensors for braking, lane departure etc, check with your car manufacturer for approved tire size / rim combinations to ensure the sensors work effectively when you go from stock rim and tires to your winter rims and tires. This is a big issue with vehicles such as the 2015-17 Honda Accord Touring and Sport. Make sure to check tire pressure ! Proper air pressure extends tread life, improves safety, and reduces fuel consumption. I did not know this but all Weather tires should be rotated to get the longest possible tread. Following both on FB: Heidi Carlson-Reid. When the temperature drops below 7 degrees, you should use winter tires. I have a new baby and winter tires would be a good way for us to stay safer on the road. Thank you! Check the tire air pressure monthly. Ensure appropriate tires for 7° and bellow.also proper rotation for even wear. I need to win this desperately. Whoa. Great prize! Safety first! Don’t forget to change them to winter ones!